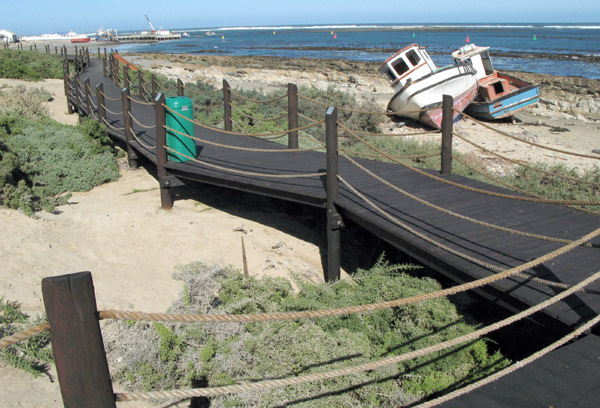 Gone Fishing » Blog Archive » Port Nolloth beach front. Yesterday (23rd) was not so great on the weather front. The sun was shinning but it was cold and a gale force wind blew the whole day. At one stage I was considering taking down my rally tent as I thought it was going to be ripped off the front of my caravan. 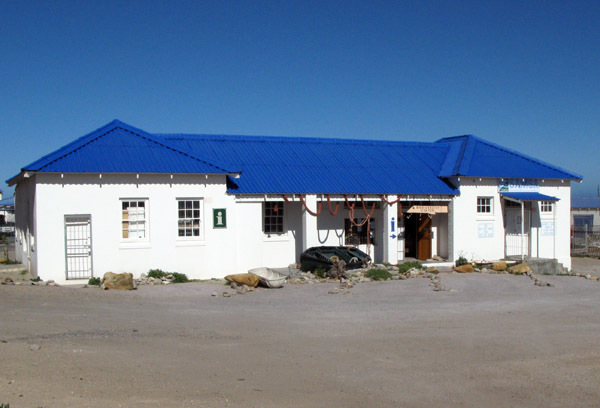 That kind of wind makes me slightly depressed so I determined to take a drive into Port Nolloth and have a look around. 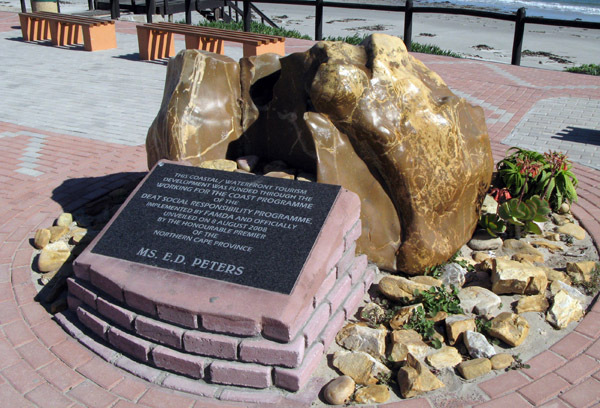 Port Nolloth was only given that name in 1855 when it was renamed from Robbe Baai (Seals Bay) by Sir Harry Smith. Prior to that it had also been known Aukwatwas (1779) and also as Gawaap. 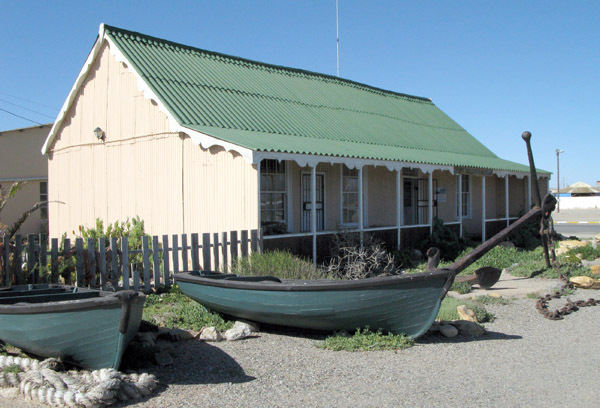 Copper was found in the Namaqualand area and the first shipment of 1 ton was was made from the harbour in 1850 and so the big rush to the area began. 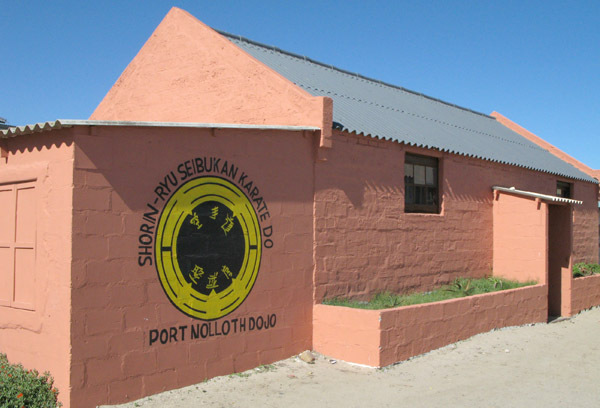 It was only in 1957 that Port Nolloth received municipal status. 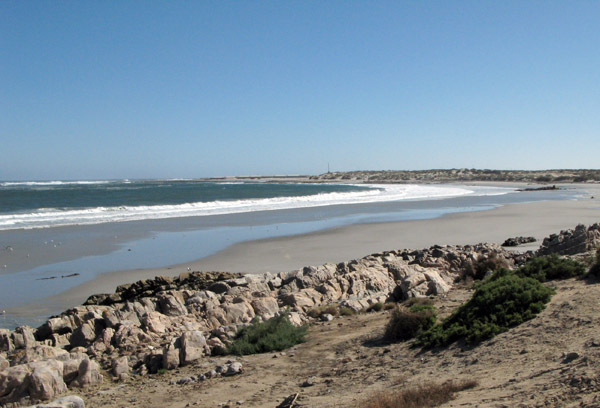 I started my walk from the northern end of Port Nolloth and the first thing I saw was a really beautiful beach. There are a few houses overlooking the beach but not as many as I would have thought. The bay to the north of Port Nolloth. The coastline round the area is very rugged, as it is all along the West Coast and there have been quite a few big storms in the last year or so. 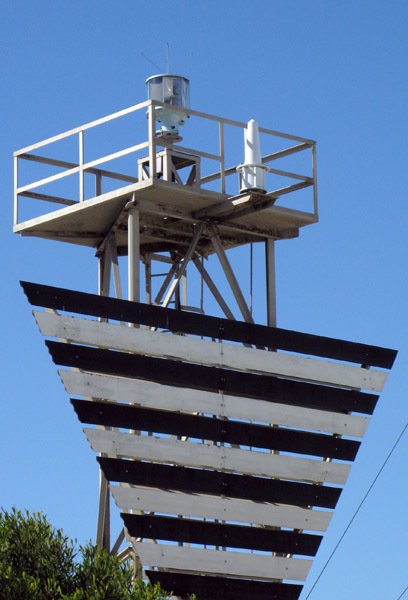 It is known for its foggy weather, has an average rainfall of 20-25mm per annum and the average daytime temperature is a moderate 22ºC and 14ºC at night. As you will see a bit further on those storms caused quite a bit of havoc. The unique lighthouse which was established in 1909. Walkway above the beach You can see 2 boats that were washed ashore recently. One of the entrances to the walkway. 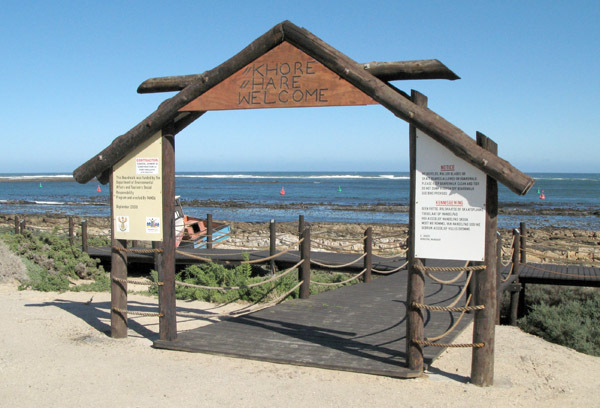 The walkway and beach front development were opened officially on the 8th August 2008. 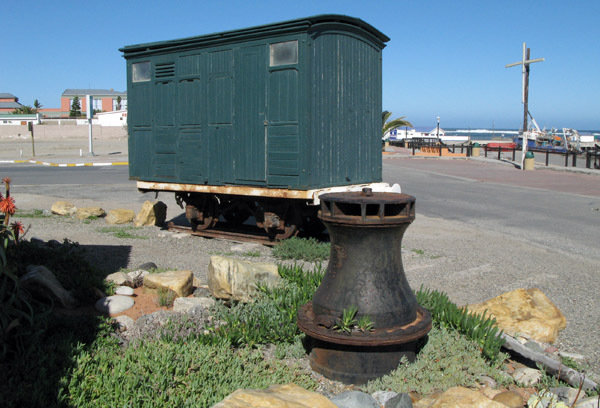 An old rail carriage in font of the museum. Good place for a bite to eat? Love the Vespa on the roof!! I have not been out for a slap up meal since I left Cape Town 24 days ago. I think this is where I will go next week some time. 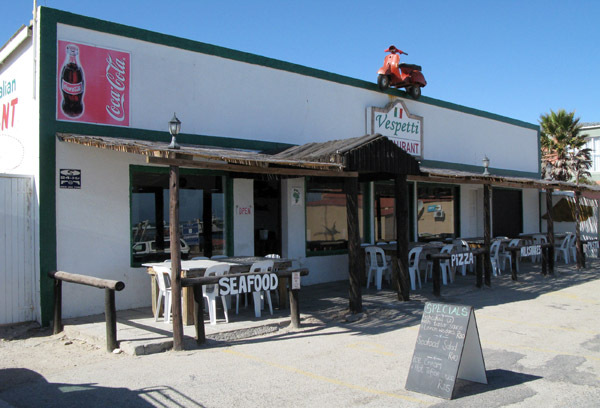 One thing this restaurant illustrates is how much bigger in all aspects Port Nolloth is compared to Alexander Bay. There are far more bigger and better shops and the population is also about four times that of Alexander Bay. 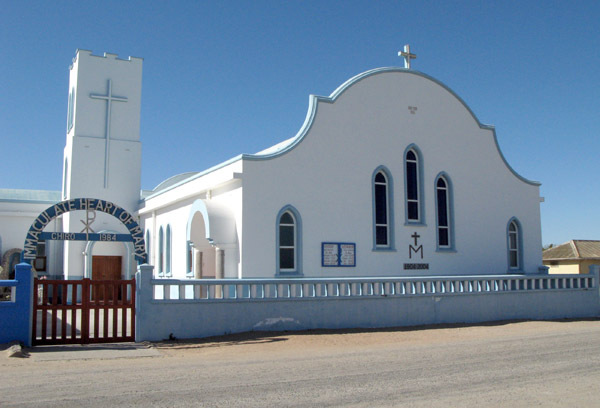 Most people from the area either come come here or drive all the way to Springbok for their monthly shopping. As I said previously I am amazed by the local Spar Supermarket. Lastly, just to show you how violent the storms can be, the boat below was washed up to where it now rests on the 16th of June this year. 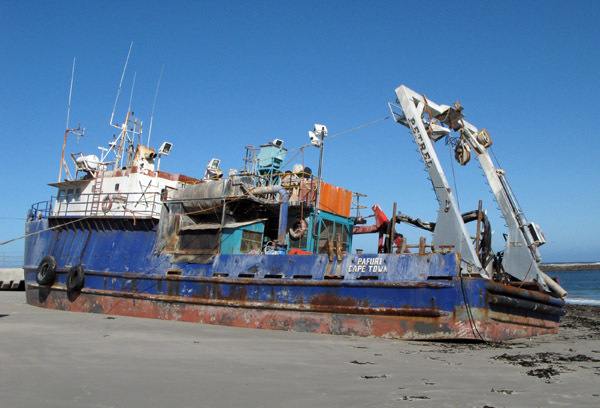 It has not been stripped down so it looks like they may try and re float her on a really high tide. Looking at how deep she has sunk into the sand it might be just wishful thinking. The Pafuri out of Cape Town.. So as you can see an interesting walk, especially if one goes into the museums and spends a bit of time there. I hope to do a post on combined visits as there are some fascinating artefacts and things to see. I also popped into the De Beers controlled harbour and had a chat to the manager, Deon Lotter, and will do a short post on marine diamond mining. 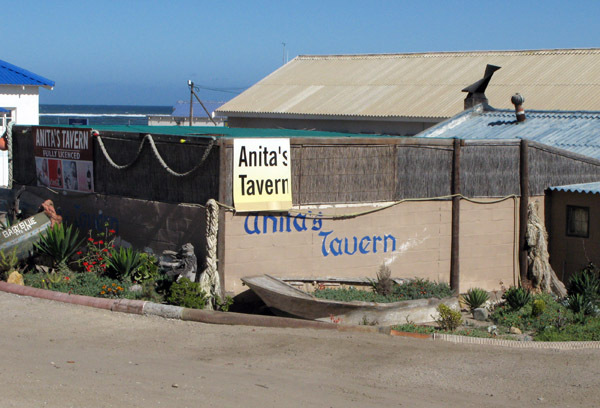 Port Nolloth looks like a great town! I’d love to visit it… Wonderful pictures! Mmmm not so sure about GREAT town but certainly a lot better than Alexander Bay. I think they also have a pretty high % of unemployment here.